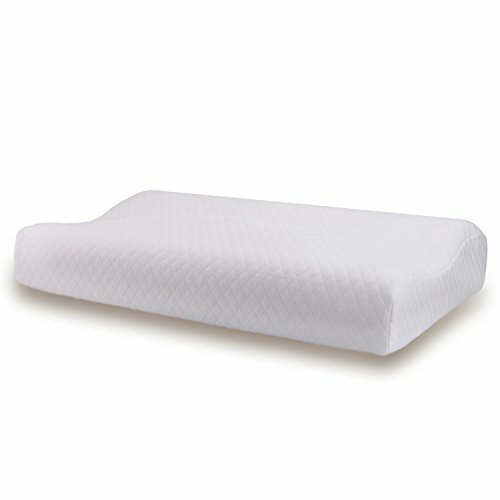 Reduce neck pains and backaches with our supportive Thetis Bedding Contour Memory Foam Pillow. Open-cell viscoelastic memory foam conforms to the shape your neck, ensuring the perfect sleeping position. Our pillow cover's hypoallergenic properties fight off allergens and is perfect for sensitive skin. Choose from our dual constructed heights for personalized neck support that'll help you fall asleep quickly, without tossing and turning. Why Use a Contour Pillow? Our memory foam pillow's contour design provides support that relaxes muscles and aligns the body, improving sleep quality. It's distinctive shape upholds the neck and head by evenly distributing weight, relieving pressure and increasing oxygen. Eliminates bodily stress and energizes you so you can wake up feeling refreshed and rejuvenated. The Thetis Bedding Contour Memory Foam Pillow is perfect for anyone who experiences tossing and turning, snoring, overheating, shoulder aches, neck and back pain, congestion blockage, or simply wishes to improve their overall sleep quality. FABULOUS COMFORT - Thetis Memory Foam pillow has a ventilated design, breathable cell structure that allows air to circulate. This Contour Memory Foampillow provides exceptional support as it contours your neck and head, which provides a more comfortable and restful night's sleep. You can experience the luxurious feeling of elastisity, support and refreshing during the sleep. If you have any questions about this product by THETIS Homes, contact us by completing and submitting the form below. If you are looking for a specif part number, please include it with your message.